Trapper Jack is a local, full service Wildlife Removal, Wildlife Prevention and Wildlife Damage Repair Company specializing in Raccoon Trapping and Removal. We Offer Free Estimates and 100% Satisfaction Guaranteed. Raccoons are one of the most commonly dealt with nuisance animals. They have adapted to living with humans. They have learned that garbage cans and dumpsters are excellent sources of food, and that houses are excellent habitat. A mother raccoon will often tear a hole in a roof to access an attic, where they will make quite a mess and a lot of noise. If you have a raccoon in the attic, it's going to make a big mess and leave a lot of droppings. They are strong animals, and once inside an attic, they often tear off insulation paper, rip open ducts, tear insulation off pipes, etc. They will search hard for food, and are fond of tipping over trash cans, raiding dumpsters, and stealing pet food. They will often break into a screened-in porch to get pet food. It's common for raccoons to poop in a swimming pool. They carry a number of parasites and diseases that can affect people or pets. (Procyon lotor) Raccoons are easy to recognize with their distinctive black mask and ringed tail. Adults range from 10 lbs on up, with some reaching over 40lbs. They can live up to 12 years in the wild, though average life spans average closer to 5-6 years. Raccoons mate in the winter, around December, and the females give birth to an average of 3-5 young. A mother raccoon is very protective of its litter of 3-5 young, usually born in the spring time. Like many mammals, they are primarily nocturnal, though some people spot them during the day, often when in search of food. They are omnivores, and will eat almost anything they can get those crafty hands on. They are very common animals, particularly in urban areas. They are well adapted for survival in cities. They are excellent climbers, and they have very nimble hands. They are also strong, and they often explore, tearing new areas open in search of food and shelter. They like to den in trees, but they love to den in attics. They are a common carrier of rabies, a potentially fatal disease. They also carry canine distemper, which can kill your dog. Their feces may contain raccoon roundworm, the spores of which humans can breathe in and become seriously infected by, so it is important to capture raccoons using human habitat. 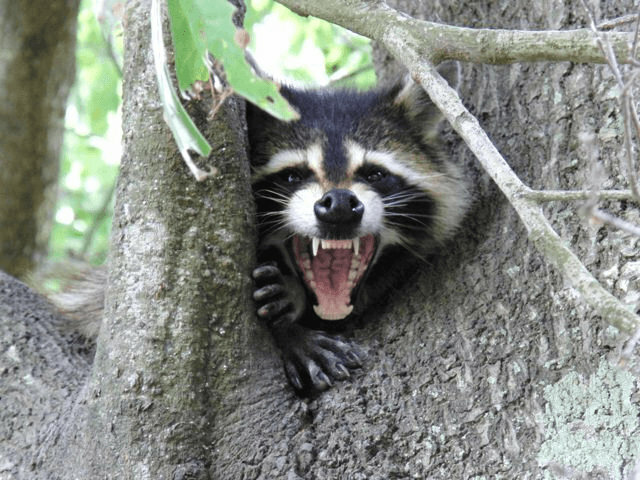 The only real means of getting rid of raccoons is through trapping and removal of the animals. If you've got raccoons in your attic, it's important that the wildlife operator search for a litter of baby raccoons, and remove them by hand before trapping and removing the female raccoon. If it's just raccoons outside causing trouble, they can be trapped and removed, but beware, they'll often dig and grab anything within a few inches of the cage trap. There are also some lethal raccoon traps, but they're not often used or even legal in all states. There is no registered or effective raccoon repellent available. You can find some products on the market, such as mothball-based or urine-based repellents, but they are bogus. Go ahead and try them. And those high-pitch noisemakers, also called ultrasonic sound emitters, do not work. There is no quick and easy fix when it comes to raccoon removal and control. It's best to have a professional trap and remove the animals properly.